When Mom moved into her last earthly home, at The Home, she could no longer walk. She had lost her husband, twice. She was losing her memory. She had given up her home. She had lost much of her freedom. We asked many people to pray for her, and I prayed that she could walk again. I prayed that she could move back to a lesser level of care. I prayed that we could play Scrabble again. I prayed for her in her times of weakness. But she wasn’t finished. She had a gift of eleven more months. She had a gift. She had a responsibility. The first time I ate with Mom at The Home I looked at her, held her hand, and asked her to say grace. I expected her to thank God for the food, and I expected her to pray for her own needs as she recovered from surgery. 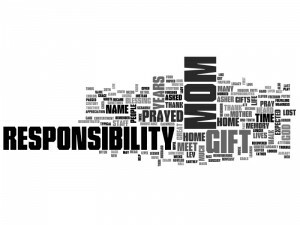 But instead, I heard her say, “Father, help me to be a blessing to the people in my new home.” She had a gift of time; she had a responsibility. Over the next few weeks, as the staff got to know Mom, sometimes they would have trouble remembering her name. Bethel, House of God, is not your typical modern name, and it took the staff, quite understandably, a while to learn it. When they couldn’t remember her name, we often heard them say something like, “You mean the nice lady who lives at the end of the hall?” That was my Mom; she was already fulfilling her responsibility. Mother learned to meet her responsibility, “Love your neighbor as yourself.” She demonstrated a kind attitude, contentment, calmness, great appreciation for everyone who served her in any way. At The Home, they cried for Mom when she died. Those who worked with Mom, those who lived with Mom, had become part of her life. They were a blessing to each other. Their lives became raveled together with ours. Mom had a gift, she fulfilled her responsibility. Mother, you have passed so many gifts on to those who knew you. Thank you for your gifts. If I can meet my responsibilities one-tenth as much as you did, I will honor you, your memory, and our God. 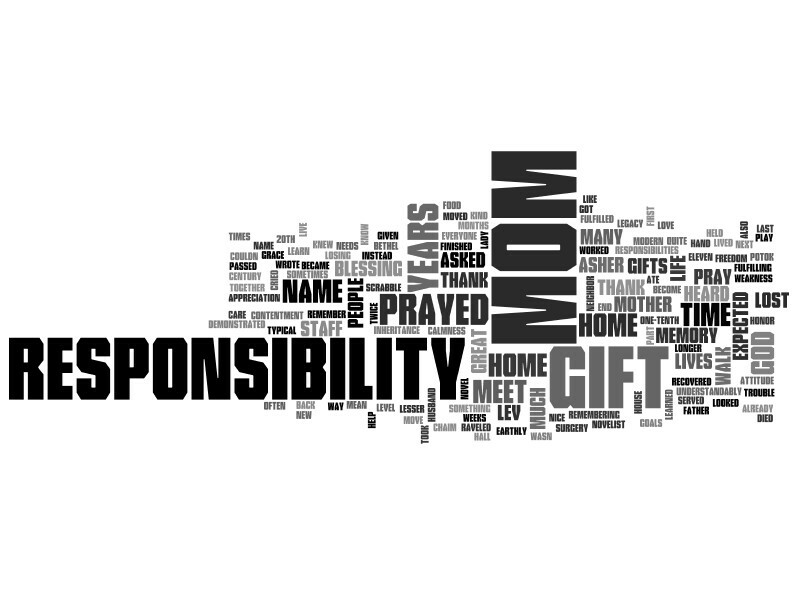 Thank you, Mom, for your legacy; thank you for my inheritance. What a mother; what a son.